My night had been interrupted several times by my urge to see the Northern Lights. Yes, I knew it was a bit cloudy when we went to bed but clouds seemed to come and go quite quickly. About midnight I rose and stood at the window. Behind our guesthouse was a big hill and as I gazed up at the top I noticed that there was a break in the clouds. There, larger than I'd ever seen it was the big dipper! It was positioned such that the dipper looked to be touching the hill and perhaps emptying something onto it. I looked all around and thought I saw something that looked suspicious in the sky but it never materialized into anything. 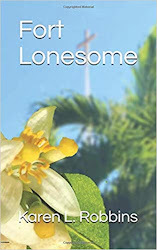 In one direction I saw a sightly greenish cloud but to my sleepy eye I thought it was probably the lights of the town down the road reflecting off a cloud in the sky. Several more times I woke and got up then finally told myself to go to sleep. It was a little after one in the morning. After our breakfast in the dining room, we headed back out to the Ring Road, #1. We still had farther to go south before we would begin heading east. As a matter of fact our destination for the night was the most southern point of Iceland. Iceland is a land of fingers. Fingers of glaciers reach out in all directions coming down from the volcanic mountains they cover and fingers of the sea reach inward creating beautiful scenic fjords. This day we would be seeing more of the icy fingers of glaciers as the southern side of Iceland showcases the largest glacier, Vatnajokull. As we drove the Ring Road, we passed through a huge moss covered lava field that seemed to go on forever. It was formed from what was called the Laki eruption that began on June 8, 1783. During the course of the eruption a series of 10 fissures opened up and the lava flowed in several directions, the one to the south almost reaching the sea. One of the western branches of the flow is said to have stopped when a pastor held his "mass of fire." The eruption ceased in February of 1874 leaving behind one of the largest lava flows in the world covering around 600 square kilometers (372 square miles). 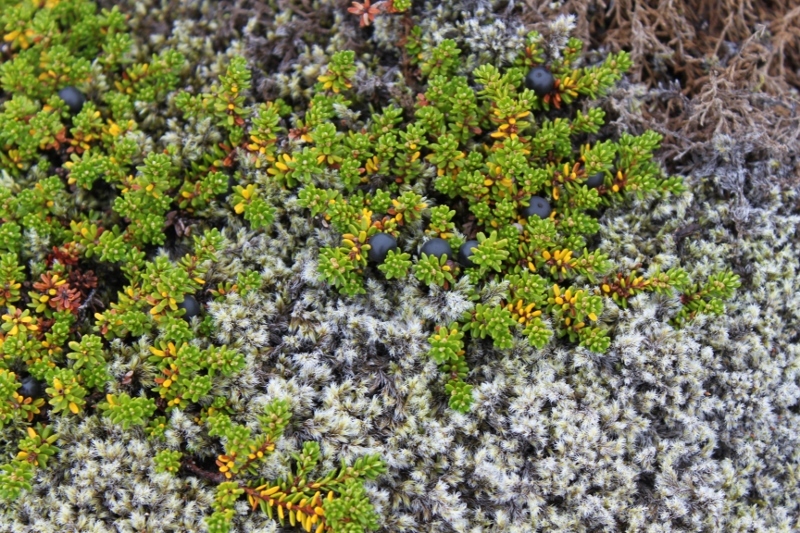 The lava has been covered by a thick moss called wooly fringe and inhibits the growth of other vegetation. 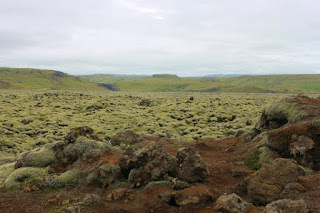 It was amazing to stand at one vatange point and look out for as far as you could see--mossy lava rocks. Bob found it interesting that the eruption had produced so much ash and other content that circled the world (as it did not too long ago and stopped air traffic for a time) that it caused a change in the weather patterns and in turn led to famine in some areas and hearty produce in others. Bottom line: the sign suggested that the famine in France eventually led to the revolution that ushered in the progression of democracy in the world. Who knew? 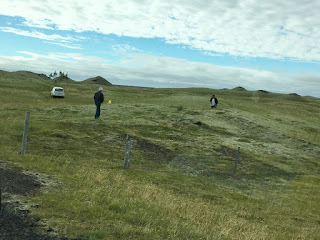 Always the curious seeker of answers, Bob turned the car around and stopped along the side of the road where we saw two women on their hands and knees in an area that had some kind of low vegetation on it. It wasn't the moss that covered the lava and we could tell they were gathering something. 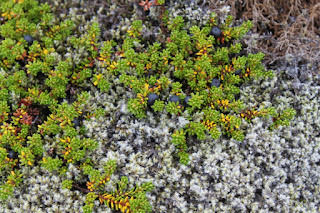 Bob found that the women spoke enough English to tell him they were gathering bilberries, a berry that resembles blueberries but is darker in color. 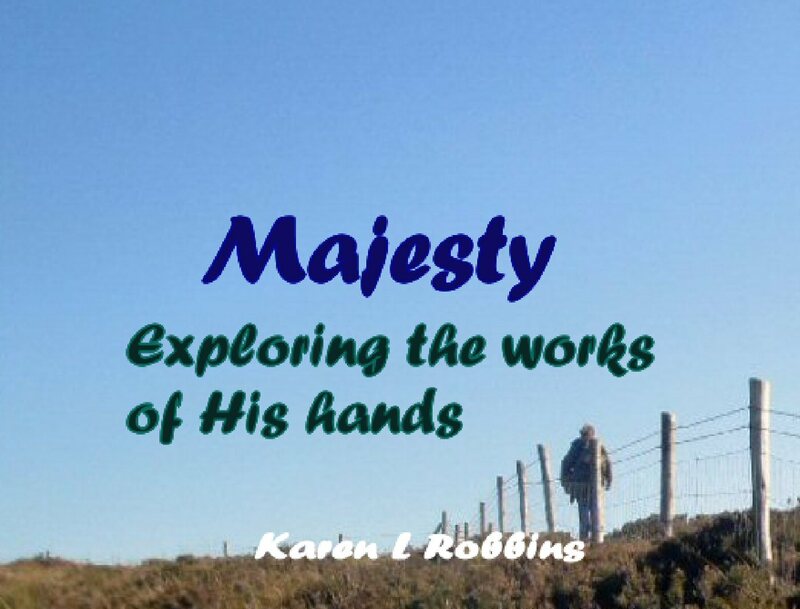 She was using a type of small tined hand rake that, when drawn through the undergrowth, harvested the berries by the handful. It beat picking them one by one. They were collecting them to make jam--something that I would find among my favorites on the breakfast table each morning. She gave him a handful and we each got to taste some. A little bitter but oh so good in jam! 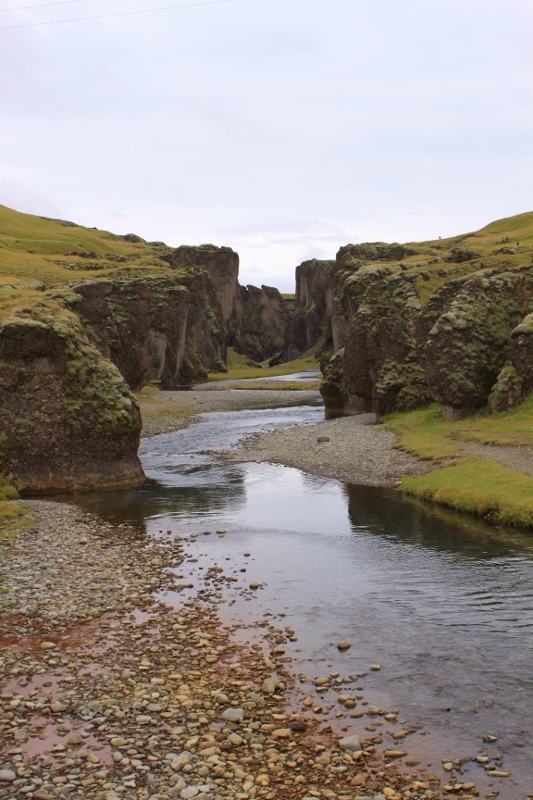 The Fjaorargljufur Canyon, our next stop was formed by a glacial river. Never underestimate the power of water. 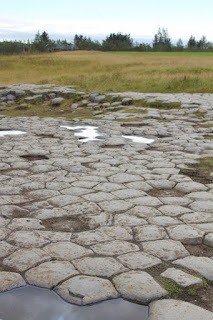 An unusual formation of rocks near Kirkjubaejarklaustur at first discovery was thought to be the floor of an old church thus earning it the name of Kirkjugolfid or Church Floor. The unusual design however is caused by the erosion of basalt columns which form hexagons usually but sometimes have more than six sides. 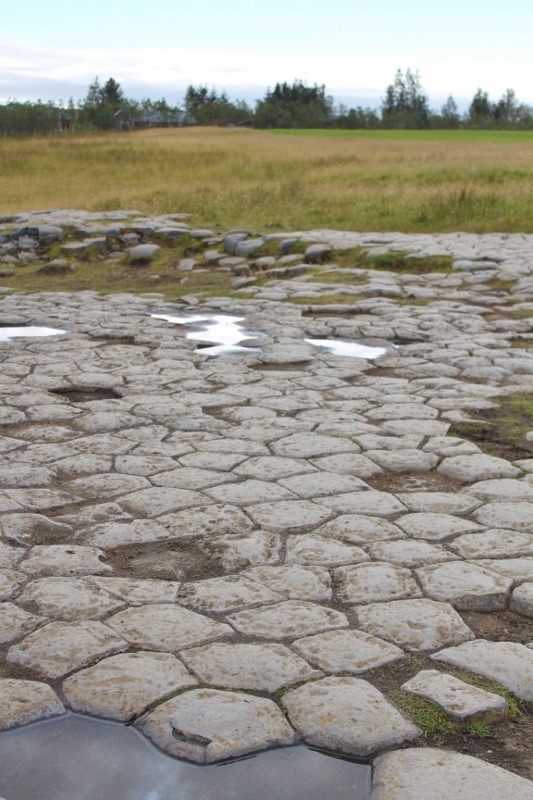 They reminded me of the basalt columns we'd seen in Ireland. Lo and behold--or should I say faith and begorra--there was an Irish connection. We passed a mound with a sign explaining what it was. Turns out the first inhabitants of the area were Irish hermits and the story says that heathens were not allowed to live there. When the pagan Hilder Eysteinsson planned to move there, he fell down dead when he set foot on the property. 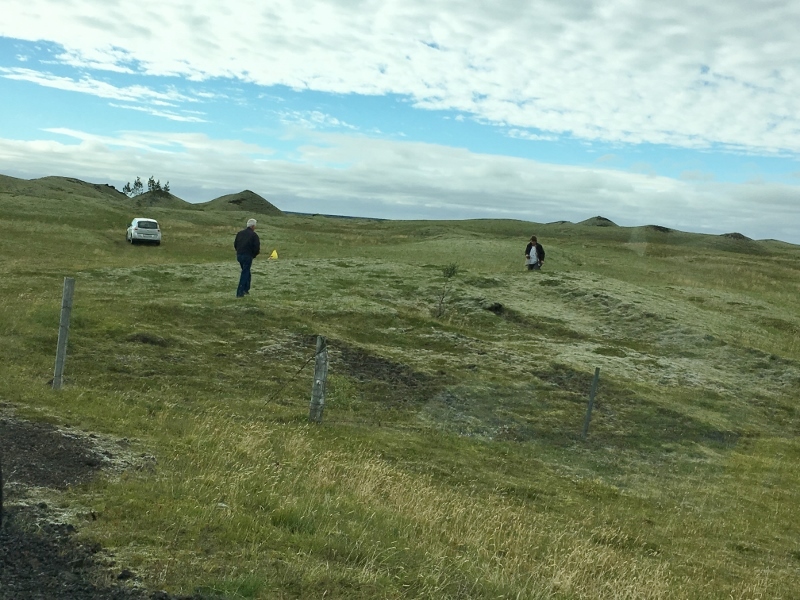 The large mound was his burial place. 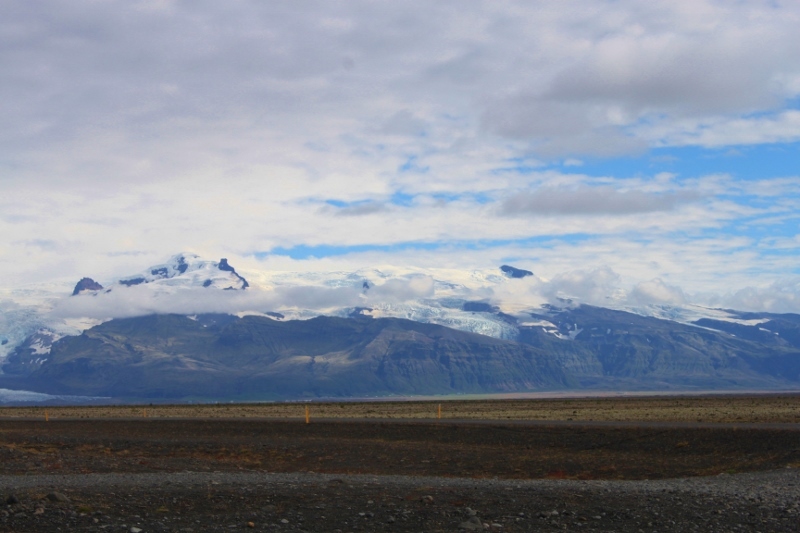 Along our route, we stopped to view a few more waterfalls and then we began to see more and more glacial fingers as we got nearer to the largest, Vatnajokull, which actualy takes up 14% of Iceland. Each of the fingers that extend down have a different name. 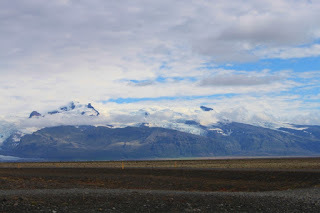 In the Shaftafell Visitor Center in the Vatnajokull National Park we enjoyed a very spicy bowl of vegetable soup at the cafeteria and then set off to walk the easy blue trail S1 to the Skaftafellsjökull glacier, about a 3 mile round trip. We had hoped to get close enough to touch the glacier but it was not to be. 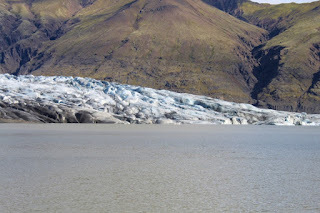 At the base was a glacial lake complete with its own set of floating ice sculptures one of which resembled a whale. The sun was shining and the temps were mild and we decided that this was getting to be a great trip. 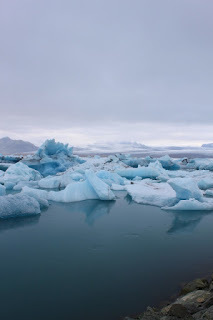 By the time we reached the Jokulsarion Glacier Lagoon at the Breiðamerkurjökull Glacier the temps were dropping and the sun had been clouded over. A misty rain was beginning and added to the chilly 5C temperature (about 41F). We donned our all weather coats and set out. 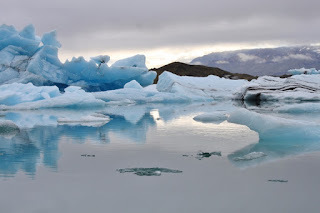 The parking lot is right next to the lagoon so there wasn't far to go and we were so enchanted by the icebergs in the lagoon that we didn't mind the chill. The icebergs break off of the larger glacial finger and are said to float around in the lagoon on an average of five years before they eventually make it out to sea or melt. They have to make it under a bridge that spans a narrow channel. The channel is what probably keeps the icebergs in the lagoon. Among the icebergs people were entertained by several seals. 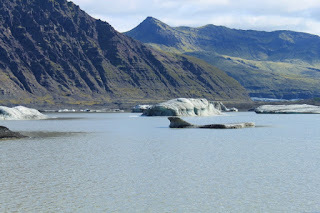 If you wanted to, you could take a boat ride around the lagoon and get a closer view of the icebergs. I thought we were pretty close as it was. We stayed until the chill finally got to us and the rain started a little more in earnest. There would be lots more views of glaciers along our route and each vista was unique and beautiful in its own right before we arrived at the Seljavellir Guesthouse near Hofn. The guesthouse was more like a modern motel but the owner's mother greeted us and showed us to our room. 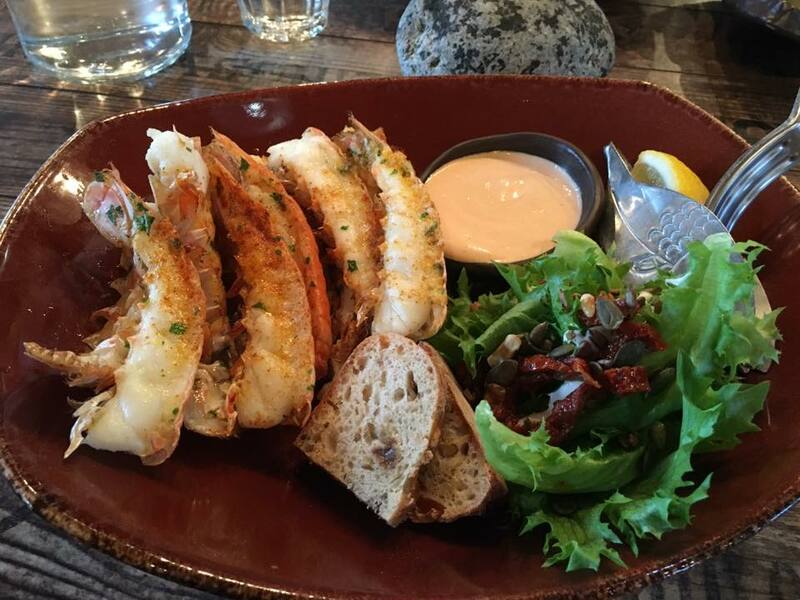 The town of Hofn is known for its "lobster" which really turns out to be longastino. It was Bob's birthday so we found a #1 rated restaurant on TripAdvisor and had what we thought would be our most expensive meal of the trip. The longastino came on a plate with some salad and a couple of pieces of homemade bread all for somewhere around $50 each. Happy Birthday, honey! A check of the aurora forecast and we determined we would not bother to get up in the middle of the night for viewing. It was cloudy, rainy, and the northern lights were not expected to be active. Ah, a full night's sleep.